It’s by now commonly recognized that the South Asian Association of Regional Cooperation (SAARC) is a broken and useless organization, given its final death blow by Indian Prime Minister Narendra Modi late last month after he pressured many of his regional counterparts to boycott next month’s planned meeting in Pakistan. The group had long held out the promise of closer apolitical cooperation and institutional integration between its members, giving hope to optimistic individuals that South Asia could overcome the daunting divide between India and Pakistan and remain a zone of peace for all of its inhabitants. Regrettably, SAARC failed to live up to its promising potential, and the bloc’s de-facto dissolution seems in hindsight to have been long overdue. As unexpected as it may be, however, the death of SAARC has paradoxically given birth to the concept of a “Greater South Asia”. India has actively sought to replace the defunct organization with the BIMSTEC grouping (which crucially excludes Pakistan, but also Afghanistan and the Maldives) as a necessary stepping stone in its Act East policy of ASEAN engagement, while Pakistan has sought to counter SAARC’s demise by reaching out to China, Iran, and the Central Asian republics in response. When the geography of these two rivalling strategic initiatives is mapped out, it becomes clear that India and Pakistan are competitively broadening the scope of their home region to include these aforementioned domains. Neither country is trying to carve out an exclusive sphere of influence, nor would they even be able to do so in any case, but what they’re aiming at is to take advantage of facilitative geography and soft power similarities in order to boost their influence and compensate for SAARC’s failures. The above constructions allow for analysts to fundamentally reconceptualize Asian geopolitics. The initial notion of “Greater South Asia” brings together the entirety of South and Central Asia, and parts of West Asia (“the Middle East”, as in Iran), East Asia (China), and Southeast Asia (Myanmar and Thailand), while the expanded idea incorporates all of Southeast Asia and a bit more of West Asia (Azerbaijan and Turkey). The only Asian Great Powers left out of a South Asian-centric reconceptualization of Asian geopolitics are Saudi Arabia and Japan, though Turkey, Iran, Pakistan, and India all have strong ties with the Kingdom, while India and China (and to an extent, even Iran) each have their own particular set of deep relations with Japan, thus proving that neither is completely left out of this construct. Russia, for its part, is engaged in a complicated Asian balancing act which thus gives it a heightened diplomatic-strategic significance amongst all Great Powers in this part of Eurasia. As can be seen, China and India have the same envisioned Asian zones of influence, which doesn’t necessarily have to be a problem unless the US encourages or misleads India into forcing a security dilemma between itself and China. It’s conceivable that the two Asian Giants could cooperate and coordinate with one another in order to ensure that the 21st century is full of win-win multilateral benefits, but judging by the existing indications of Modi’s hostility towards China and Pakistan and the ongoing competition between New Delhi and Beijing all across the IOR, the odds are high that at least some degree of tension will characterize this period. It’s also interesting to note from the above that China and Pakistan share a desire to increase their presence in Central and West Asia, two of the three areas in which India is also simultaneously trying to promote its own sway. It’s predictable that the Chinese-Pakistani Strategic Partnership will be tapped into by both sides in order to promote their collective interests, but in the event that a zero-sum India aggressively competes with either of them in these regions, then it’s guaranteed that the other member of the partnership will come to its aid. Since there are three actors (two of which are allied) in the Central and West Asian theaters as opposed to just two like in the simplified “Greater South Asia” proposal between Pakistan and India, this indicates that it’s much easier for an unintended escalation of the security dilemma to occur or for the US to mischievously prompt such a scenario. Building off of what was hitherto described in the research, it becomes increasingly evident that the 21st century won’t just be an “Asia-Pacific” one like many commentators have said, but could more accurately be described as an “Indo-Pacific” future like a few analysts have proposed. The immediate logic in this is that most European-Asian trade transits through the IOR and will likely continue to do so even in the coming decades, despite the groundbreaking work that China has undertaken on constructing multiple Silk Roads all across the supercontinental mainland. It will take time for each of these projects such as the Eurasian Land Bridge and the economic corridors with Iran to gain traction, and moreover, there are plenty of Hybrid War scenarios that could occur to offset the long-term viability of some of these routes, especially those in the “Greater Heartland” of Central Asia, Iran, and Pakistan. Additionally, China is forecast to become even more dependent on the IOR because of the paramount importance that Africa will have for the sustainable economic growth of the People’s Republic. India, for its part, is endeavoring to expand its maritime trade capacities with ASEAN and further across the Pacific to the US, so the intertwining of the Indo-Pacific is increasingly evident. Even the world’s most dynamic trade bloc of ASEAN straddles these two oceans, so it’s impossible to speak about one without referring to the other, especially as the Chinese-Indian Cold War heats up as per the US’ devious machinations. The core of continental competition in Asia could conceivably be between China and India, with the most immediate focal point of this rivalry obviously being ASEAN, though it could also turn out to be that the commercial struggle between the two in the ‘peripheries’ of West and Central Asia could also leads to trouble between the two Asian Giants. What seems inevitable, though, is that the Indian-Pakistani rivalry will serve as the fulcrum of continental geopolitics because of the existential hate that India has for Pakistan and the strategic interlinking of China’s own security with Pakistan’s. Beijing is building the China-Pakistan Economic Corridor (CPEC) in order to avoid the bottlenecked Strait of Malacca and attain free and unrestricted access to the IOR, from which it could then more easily trade with the EU and Africa. CPEC is the top international priority for China and will remain so into the coming decades due to the priceless geostrategic importance of this project to China’s grand designs, so Beijing absolutely cannot allow New Delhi to destroy Islamabad and forever restrict China’s IOR prospects to the highly vulnerable Strait of Malacca. India might not be irresponsible enough to initiate an all-out war with Pakistan (or it might be held back from doing so if its Russian balancing partner’s wise advice sobers it up from the intoxifying dreams of grandiosity that the US promises it in exchange for “a little bit” of aggression), but in any case there’s a disturbingly real chance that a “proxy war to end all proxy wars” might be unleashed all across South Asia. The main point, however, is that China’s security is just as inextricably linked to Pakistan and South Asia just as much as it is to East Asia, Southeast Asia, and the South China, if not more. The argument can convincingly be made that the successful completion of CPEC would largely nullify the “containment” policy that the US is pursuing in the South China Sea, while the Northern Sea Route through the Arctic and the continental Silk Roads across Eurasia would secure China’s trade routes with Europe. All three of these East-West routes lead to the EU in one way or another, but only CPEC has the potential for connecting China to the African marketplace, which thus makes it absolutely irreplaceable to Beijing’s larger strategic calculus. If CPEC was sabotaged due to an intensified Indian-American proxy war against Pakistan or totally destroyed as collateral damage from an Indian-initiated hot war, then this would inordinately harm China’s long-term security by cutting it off from direct access to the IOR and onwards to Africa and return it to the strategically vulnerable position of having to depend on the South China Sea and the Strait of Malacca chokepoint, thus setting it up for geopolitical blackmail in the future. This is why China’s security is inseparable from Pakistan’s, which thus links the Pacific East Asian country to its South Asian ally and completes the strategic coupling of the Indian and Pacific Oceans in arguing for an Indo-Pacific Century. 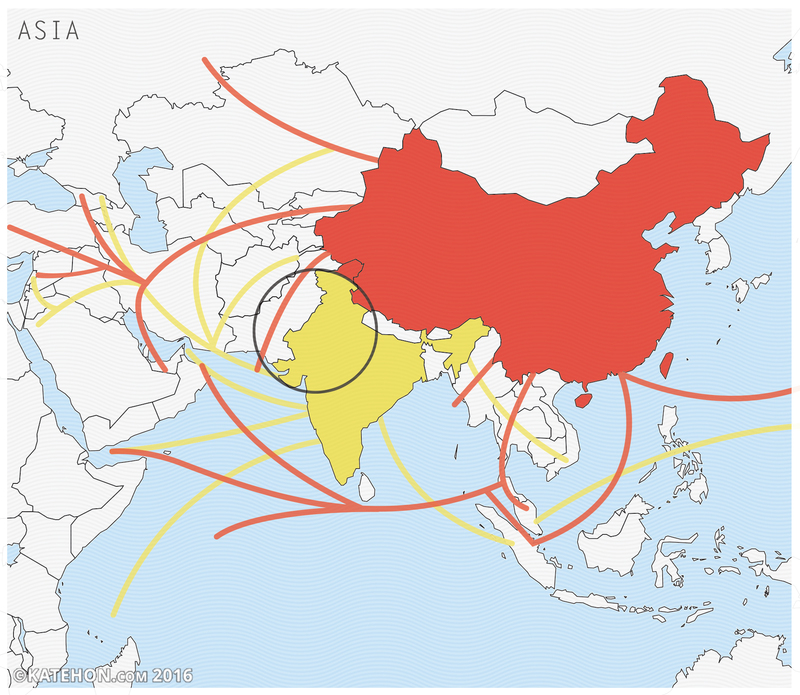 The map clearly shows how China and India have shared trade and infrastructure interests in Iran, Myanmar, and Thailand, which suggests that they might temper their Great Power competition out of concern that it could be doubly detrimental to both of them, which is why no concrete forecast is being made about any efforts that New Delhi could take to disrupt Beijing’s projects in these countries. The reason why Pakistan and CPEC figure so prominently into this continental model is because India does not perceive itself as having any win-win interest in this country or initiative; on the contrary, it identifies its national interest as being the destabilization of its neighbor and resultant disruption of any international connective infrastructure projects running throughout its territory (with the possible exception of TAPI). The historical rivalry between India and Pakistan is also an important factor that’s missing between the two Great Powers and their aforementioned shared state counterparts (Iran, Myanmar, and Thailand), though the lingering distrust between India and China as a result of the 1962 border war and Modi’s recently hostile military moves along that same frontier combine with New Delhi’s hate for Islamabad and Beijing’s irreplaceable grand strategic security concerns vis-à-vis Pakistan’s CPEC to create a vortex of potential violence in South Asia unparalleled anywhere between these two countries in the Mideast or Southeast Asia. To reiterate one of the most important points in this text, China and India are not preordained to enter into conflict with one another or continue their nascent Cold War, and it’s still feasible that they could put their respective differences behind them in augmenting the other’s connectivity capabilities, but the US is desperately doing everything in its power to sow the seeds of a piercing security dilemma between these two countries and preempt this multipolar scenario. Pakistan and CPEC have been chosen as the polarizing targets for baiting India against China, which is a no-brainer because of the intense hostility that New Delhi already has towards both of them. For a Hindutva supremacist such as Modi, they’re simply irresistible, since he knows that destabilizing one of them instantly affects all three (Pakistan, CPEC, and China), so it’s “too good” of a chance for him and his “deep state” (permanent military-intelligence-diplomatic bureaucracies) to pass up. All of this is expected and none of it should be new for the reader, which reinforces the point that it’s already common knowledge to American strategists as well and shows just how easy it has been for them to manipulate Modi and his government into siding with the US against China, whether they even consciously know that they’ve been pulled into this trick or instead are so self-deluded that they think they’re only pursuing their own interests by doing so. “An arc of crisis stretches along the shores of the Indian Ocean, with fragile social and political structures in a region of vital importance to us threatened with fragmentation. The resulting political chaos could well be filled by elements hostile to our values and sympathetic to our adversaries." It’s plain to see from this description that Brzezinski’s pre-Mujahedeen strategic thought influenced his post-Cold War work about the “Eurasian Balkans”, which postulates that “portions of southeastern Europe, Central Asia and parts of South Asia, the Persian Gulf area, and the Middle East” are all subject to Balkan-like fratricidal identity conflict, with the wink-and-a-nod inference being that this could be manipulated by the US in order to keep the Great Eurasian Powers of Russia, China, and Iran indefinitely separated from one another as per the Wolfowitz Doctrine of preempting any future threats to American hegemony. Ralph Peters forecast some of the specific outcomes that could occur in the central Mideast-South Asian portion of this conception, which resulted in the following geopolitical scenario map. The New York Times modified his vision just a little bit in 2013 when speculating upon “How 5 Countries Could Become 14”. The methodology of predicting the geopolitical dispersion of multiple identity conflicts such as the ones that Brzezinski, Peters, and the NYT forecast for North Africa, the Mideast, and South Asia was outlined by the author in his article about “The Law Of Hybrid Warfare” and related series about each outlined geographic component. In pertinence to the Arc of Crisis and “Greater South Asia”, the Hybrid War research on ASEAN and the Greater Eurasia Scenario piece about South Asia’s “Proxy War To End All Proxy Wars” fit into the paradigm of manufactured divide-and-rule identity conflicts all along the IOR and the South-Southeast Eurasian Rimland. Although India and Pakistan are both powerful nuclear-equipped countries, each one has their own respective identity vulnerabilities which could be exploited by outside forces to differing ends, with India being infinitely more susceptible to this than Pakistan is, but which wouldn’t be targeted by Islamabad for this sort of asymmetrical disturbance unless New Delhi first continued with its attempts to destabilize Balochistan, the Federally Administered Tribal Areas (FATA), and Gilgit-Baltistan as part of its Hybrid War on CPEC. What the author wants to draw the reader’s attention to isn’t necessarily the possibilities that each rival has to covertly dismember the other, but to raise awareness about how the model of manipulative American interference in the identity-diverse Mideast region could seamlessly be juxtaposed to South and Southeast Asia in fomenting similar fratricidal conflicts as the ones which are currently raging. Unlike the “Eurasian Balkans” of ‘old’ which had their center of gravity in the Mideast, the “New Eurasian Balkans/Arc of Crisis 2.0.” are focused on South Asia. This is because they swap out the Balkans and North Africa for the rest of South and Southeast Asia, which are more relevant to the Indo-Pacific Century. Moreover, this variance of Brzezinski’s “Eurasian Balkans” framework (or once could say, expanded redux of his ‘vintage’ “Arc of Crisis” theorem) clearly shows just how pivotal the centrally positioned CPEC project in this modified conception and underpins the importance of peaceful Indian-Pakistani relations in maintaining stability all throughout this interconnected strategic space. The “Greater South Asia” that India and Pakistan are unintentionally forming through their geographically divergent attempts to counter the other directly impacts on China’s strategic security and thus makes Beijing the third player in this rivalry, albeit one which is solidly on Islamabad’s side. This helps to keep the geostrategic balance between India and Pakistan in the post-SAARC regional order because Islamabad isn’t capable of influencing ASEAN to the same degree that India can do to Central Asia, which would otherwise tip the scales of strategic initiative towards India’s side had it not been for China’s own intrinsic interest in this far-reaching South Eurasian-wide affair. Pakistan’s security is inseparable from China’s due to the game-changing CPEC that aims to connect Beijing directly to the Indian Ocean Region (IOR), so it’s for this contemporary reason why China would never let India “get the best” of its Pakistani ally no matter. It needs to be continuously emphasized that there is no more important New Silk Road project for China than CPEC, and this is because of the incomparable geostrategic leverage that it would give Beijing in circumventing the Strait of Malacca chokehold in gaining free and unrestricted access to the IOR. Even if complementary projects through Thailand (ASEAN Silk Road) and perhaps even Myanmar one day (Myanmar Silk Road) are eventually completed, they would still pale in comparison to CPEC because of their relatively less reliable nature. China and Pakistan are all-weather allies and there has never been a significant disagreement between them, unlike China’s relations with Thailand and Myanmar, and both parties are also geographically adjacent to one another in contrast to China and Thailand. Furthermore, China and Pakistan have shared geostrategic interests in balancing against India, which has been quite aggressive as of late due to the unprecedented military-strategic partnership that it recently clinched with the US. All of these related factors reinforce the confidence of Chinese decision makers and strategists that CPEC is the singlehandedly most pivotal and dependable overseas project that their country is involved in, which is why they will not allow it to be offset by American-Indian Hybrid War interference. The nascent Chinese-Indian Cold War that has crept across the region is a worrying sign of what might be to come if India doesn’t back down from its asymmetrical hostility in seeking to undermine the Chinese-Pakistani Strategic Partnership, and it’s consequently possible that the Great Power competition between these two Asian Giants might come to envelop all of “Greater South Asia”. The geopolitical friction that this could create and the potential that it would have for spreading all throughout the IOR and its hinterland environs gives plausible credence to the fears that Brzezinski’s 1970s “Arc of Crisis” might be rising once more all throughout the Indian Ocean Rimland. Almost four decades after the Polish-American mastermind initially conceived of this strategic model, tactical-operational modifications have dangerously occurred which suggest that the chaotic crises that he envisioned would be characterized by a multisided identity-centric Hybrid War of varied non-state actors. The “Eurasian Balkans” template that Brzezinski outlined in the 1990s was later fleshed out by Ralph Peters with his “Blood Borders” scenario and finally put to the test after the 2011 “Arab Spring” theater-wide Color Revolutions, proving that there’s an observable evolution of this divide-and-rule stratagem which could conceivably be transferred to the similarly identity-diverse regions of South and Southeast Asia, the former of which is the center of gravity for the “Arc of Crisis 2.0” that’s frighteningly reappearing in a new and enhanced form. For as much as the new concept of “Greater South Asia” could be used as a multipolar structure for peace and win-win cooperation all throughout Eurasia, it unfortunately looks to be the case that the US hijacked this vision before it ever had a chance to prosper and is now weaponzing it as a transregional proxy battlespace against China. India and its Hindutva supremacist leader Modi fell for the anti-Chinese/anti-Pakistani ‘bait’ that the US held out before it and are now poised to expand the Chinese-Indian Cold War all throughout the IOR, aided and abetted by Washington’s “Lead From Behind” Hybrid War machinations. While New Delhi might think that Washington is doing all of this out of the pursuit of their subjectively shared interest, the truth is that the tense intra-Eurasian, -BRICS, and –SCO geopolitical division (which is different than financial and economic, it should be said) between India and China only serves the interests of the unipolar world, no matter how much the Indian “deep state’s” blind hate for Pakistan and China make it think otherwise at this moment in time. It’s still not too late to turn “Greater South Asia” into an interfacing platform of mutually beneficial economic-financial interaction between India and China, but for that to happen, India needs to step away from the US and reevaluate the wisdom of listening to Washington’s hostile advice against Pakistan and China. Only if India fundamentally reverses its pro-American geostrategic shift can it prevent “Greater South Asia” from turning into the greatest Hybrid War battleground of the 21st century.